I was in the car, there were 2 cars behind me and it can be tricky to see behind at night. I wonder if anyone else has footage? I was a bit mad when they black flagged me for it, but In the end, I'm not upset. my car only has some minor scuff marks and they gave the time back. It could have been a lot worse. I think they could have found my team and asked them about it instead of pulling me from the race. I just thought it was worth mentioning since it was a bit strange how it all played out. officially i think they ruled it a racing incident. Crowd control could probably argue that I moved over on them. I'm not trying to start anything. Mostly just trying to explain to those watching the race cast what happened with the timing at the end. Shout out to Cone Crushers they ran strong both days, so the victories were well deserved ! I think they have a great build for our series, if anyone wants to complain, I say build a faster car and catch them. Hopefully we will run with you guys next race. Cheers guys! I like these kinds of builds, I want more of is in chump, I say we open up the rules more for these kinds of cars because that is what attracted us to the series in the first place. people, spectators, and potentially sponsors love the cool builds. Chumpcar is on the verg of becoming a big deal, lets reinforce what make us unique from all the other racing series. Racing is never fair, well maybe in a spec series but even then. So all the guys with bmws cant keep up anymore? lets give e30 and e36s more points so that they can catch up, to the fast cars that are withing the current rules. Chumpcar has rewarded creativity in the past, please don't turn this into a spec series! So in other words your solution is to take anything competitive, and give it more points so it isn't competitive. And you admit that you wouldn't build one if the points were adjusted? I might be biased but my car doesn't seem that unfair to me, my car is close to 500 points, i have raced 6 races with it now. I have been able to achieve top ten finishes, but never podiumed. You are basing all your accusations on one persons car and success. And who knows maybe the green car is bending the rules to an extent. but so far as I can see, all of his extreme modification are still within our current rules. perhaps these areas such as weight reduction and aero need to be looked at more closely. While the mr2 is a great platform, it is no where near the ballpark of current chumpcar speeds without major modifications. So I don't think the answer is to punish all the other teems who have tried to make the mr2 work in our series just yet, as their success is still quite limited. If all the mr2 teems all of a sudden start being massively successful, I would say you have a valid point. we cant always punish success, when we actually need to promote it for others. Attempting to take away the mr2s ability to ever be successful, as you are suggesting, perhaps would would set a new president for the way the rule philosophy of our series works. i believe this would be a tragedy. I think its a challenge to keep up with some of the new builds that people are coming up with, for example e46s are already very competitive with almost no mods. meanwhile there are a lot of car older obscure cars that are no longer competitive. My solution would be to add more points to the teems that are struggling to work with. basically give slower cars more points so they can catch up to the faster cars. because otherwise, the newer cars that are now legal like e46s, will dominate our series. this may be the case, I would also argue that some of the other cars are overvalued. Racing is never fair, especially when we have such an open set of rules as champcar. hopefully our organizers can identify these imbalances and keep the series competitive for everyone. been trying for two years now, trust me its not that easy. how many mr2s have you raced? and why don't we see more mr2s? last race felt like a spec e30 race to me. I want the variety of cars chumpcar has provided. i challange others to build an mr2 for chumpcar. my mr2 is at almost 500 points with the same swap as the green car, and it is fast, but never been fast enough to win yet. there has ALWAYS been an imbalance in cumpcar, part of the fun is trying to build something competitive within the rules. the series is getting faster, the cars are getting faster, we used to not have e36 bmws and e46 bmws, but now we do, if sombody is beating you on the track i suggest you change your game, not blame the rules. VPI got lowed for several cars with the 2017 rule change, not just the MR2 since it was based on power to weight an NA MR2 got more of a bump then others, be cause its was under powered, and overweight stock. also it seem we are seeing a trend of heavy cars doing well like sc300 possibly because there is more weight to take out. With the big rule change at the beginning of 2017, a lot of teams got hurt bad with the new swap rules, our swap now cost 200 points instead of like 75 points, that is why a lot of cars point values had to be lowered, especially if it would require a swap for that vehicle to be competitive. While I think the system still needs a few tweaks, i think chumpcar did a good job with these new rules. I would argue that that Biohazards performance was flattered by the nature of AMP. Remember this is a track that Miatas do well at, and horse power doesn't seem to mater. The nature of the mr2 works well there. We have seen Biohazard at other tracks recently where there was not this type of speed delta between him and other cars. Unless hes made a major breakthrough recently, I would expect to see him back to running the same times as everyone else at the front, at the next event. I haven't weighed our car recently but I think its around 2500lbs stock would have been 2600-2700, I don't know troys exact weight, but i Know its hundreds of pounds lighter. They had to deduct points on a few cars like this due to the new swap rules that first came out for 2017. remember swaps used to cost a standard 75pts, even if it was a 500hp ls7, as long as it was cheaper then your current engine. I think the vpi and swap performance index need to be closely looked at. there are a few cars that got screwed with the new rules for sure. hopefully chumpcar can find a way to to make it even for everyone without having to breakout dyno and scales at the end of every race. However the new rules are an overall improvement in my opinion, since it is base more on power to weight. Even with the 150 point deduction, the points with the swap is actually more then it was before. remember we didnt see troy or bill race the first part of the year because they had to go home and take stuff off their cars. Troy Truglio is the mastermind of Chumpcar in 2017. I race the orange and black, mr2 and we were 6 odd seconds a lap slower with our strongest driver, with a similar build. However, Troy has cut more weight out, he has better aero, he has a better suspension setup. I think most of this come down to the fact that Troy has been at it longer then we have. I would argue that most of the cars that we race in chump could be built to the level of his car. but you have to understand, he has gone though a lot of R&D to get where he is. I think cars like the GWR BMW have the right idea, however, it will take some trial and error to figure out the setup on a car like that. For us, figuring out setup and reliability issues on our car has been a pain. But every time it breaks we fix it, and every race we learn more, and we get a little faster. I wish there were more teems willing to try building a mr2; instead I regularly hear about how our series is overrun with BMWs and Miatas. 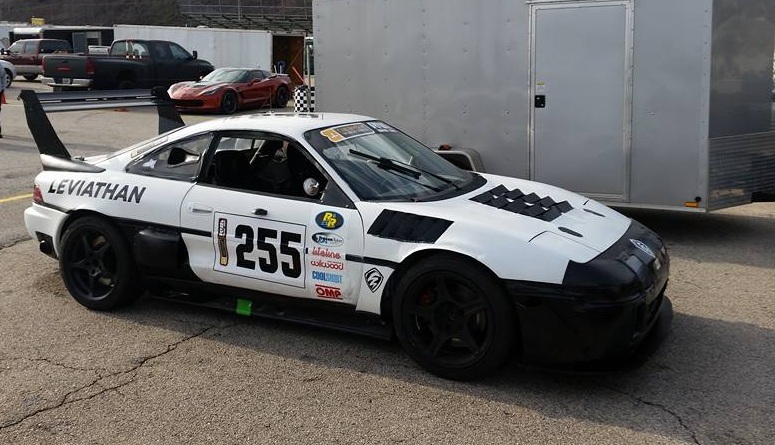 I think most of us like to see the wild and crazy builds people come up with, for me this is part of what make Chumpcar so special, and if you don't like it, I suggest you go find a spec series to race in. Looking for a new permanent team mate. sorry we are located in Athens Ga, spelling inst my strength, spell check is usually my friend but it let me down.